Guillermo del Toro's Beautiful New Movie, The Shape of Water – AiPT! What shape does water take? Acclaimed writer and director of Pan’s Labyrinth (2006), Hellboy I (2004), Hellboy II (2008), and Pacific Rim (2013), Guillermo del Toro has his own thoughts on the subject. “It takes the shape it needs to. Like love. Both are gentle, malleable, and yet they break through every barrier. In the film, “The Asset” is the shape of it.” Reddit AMA Dec. 4, 2017. 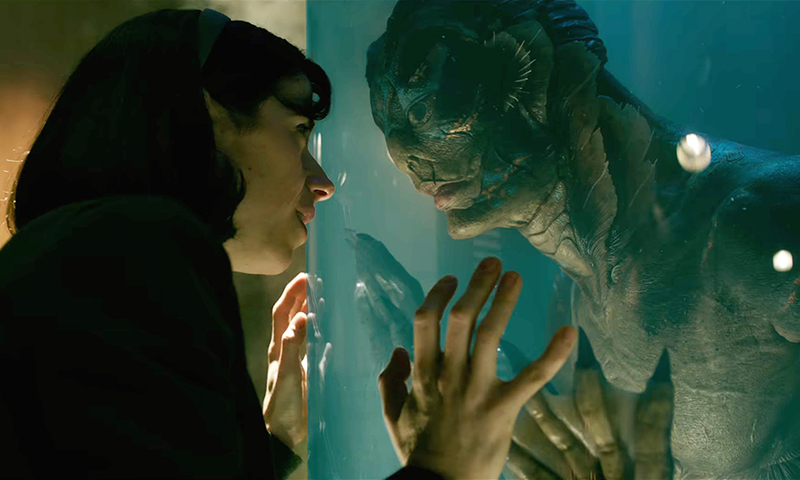 His newest film, The Shape of Water, set in early 1960’s America, pulls viewers into a dreamlike fairytale with softly refracted lights and dark shadows dappled throughout the narrative, alive with the attention to detail we have come to expect from a del Toro production. Elisa Esposito, the unlikely heroine of our story, played by London born Sally Hawkins, was rendered mute due to an unspecified event which left her wounded and abandoned by a river as a baby. She moves with silent gracefulness through her routine but otherwise fulfilling life, pained only with a longing for an intimate connection with another. She works the evening janitorial shift at a research facility with her chatty co-worker and friend Zelda Fuller, played by the talented Octavia Spencer, and it is there the two find themselves unwittingly thrust into the middle of a tale filled with the secrets of a country at war, international espionage, and at the center, the unprecedented discovery of a beautiful, mysterious aquatic creature. As head of security and the initial captor of “The Asset,” Richard Strickland, played by Michael Shannon, embodies the cruelty and monstrous behavior expected to come from the amphibious being. Del Toro is known in many of his films for showing the heart of man to be morally flawed while his sometimes disturbing creations prove to be heroic and honorable. Beauty lies in the otherness of his monsters whereas, in his world, evil lurks in the sameness that we as a society tend to require of one another. With the Cold War and the era of civil rights as the backdrop of the film, the unflinching differences between the characters become more pervasive. However, del Toro weaves them together with a tenderness that shows how true connections form when we are our genuine selves. It’s what lies underneath the mask we wear in life, the shape of who we are inside, that allows love to grow and flourish. Del Toro has said many times that the development of “The Asset” was a true labor of love. He, along with the designers at Legacy Effects, took over three years to take the character from paper drawings and scale models, to the final foam-latex animatronic suit actor Doug Jones wore for the role. It was through this story that the writer and director has been able to realize the culmination of a lifetime love-affair with another amphibious man, The Creature from the Black Lagoon. Captivated from childhood by the reviled creature in the 1954 film, del Toro found it heartbreaking that the love the creature felt for the leading lady, played by Julie Adams, remained unreturned to its tragic end. “It was a beautiful unrequited love image. You know, quintessentially romantic, quintessentially fairy tale, quintessentially B-movie monster. And the multiplicity of that moment, the beauty of it really floored me,” he said to NPR’s Sam Briger in the December 5th ‘Fresh Air’ interview. One of the many scale models sculpted by the effects team to get the proportions (especially the derriere) just right. Without a doubt, the painstakingly detailed work paid off in droves with the final result of the film. While there is nothing new about the idea of the dark fairytale, del Toro breathes fresh life into the trope by embracing the flaws and differences between the characters. It’s those little quirks, those little instances that show the trueness of self, that make this film the instant classic it is destined to become. The Shape of Water is an absolute must-see.